Nebula Review 2019: Is Nebula a Good Hosting? Nebula is a Finnish Information and Communications Technology (ICT) firm that offers top-of-the-line managed cloud hosting and virtual dedicated server solutions as part of their extensive digital portfolio. They mostly serve the Finnish market with their digital solutions. 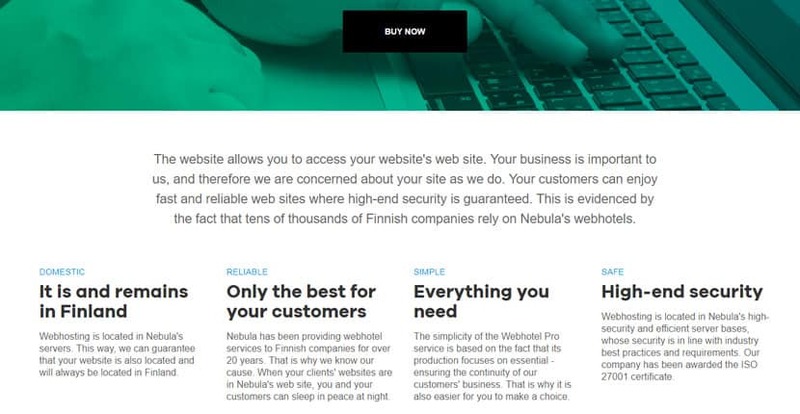 Founded in 1997, Nebula is a Finnish Information and Communications Technology (ICT) firm that offers top-of-the-line managed cloud hosting and virtual dedicated server solutions as part of their extensive digital portfolio. Over the two decades they’ve been in business, their prices have been frozen at the same affordable ranges as when they first started – a rare trait in the field of web hosting. They serve tens of thousands of Finnish companies with their digital solutions. Nebula’s core mission is to support Finnish companies with a comprehensive suite of digital solutions. While they do offer web hosting, this is only a small aspect of what they do. Since every business is different, Nebula doesn’t have many pre-made packages available; instead, their expert team of research scientists and engineers will work with you to tailor a solution specific to your company’s IT needs. All of Nebula’s servers are located in Finland and equipped with state-of-the-art hardware and security infrastructure. This means that every website hosted with Nebula will also enjoy Finland’s strict data protection laws, low risk of natural disasters, and extremely low levels of corruption. Further, to prove just how much they care about data security, Nebula has worked to attain the ISO-27001 certificate. This indicates that the company has achieved the highest standards for information security in their systems. This package is fully customizable during the checkout process. For instance, you can add MySQL databases, extra mailboxes, spam filtering, email antivirus protection, additional storage, and SSL certificates as needed. It’s unclear whether Nebula includes features, such as a WYSIWYG website builder or one-click script installer as a standard part of their package. Given their focus on customizable solutions, you may have to contact them and specifically request this if it’s an important component for you. Nebula also has cloud hosting, Microsoft Exchange email hosting, virtual dedicated servers, and domain registration services available. Though tailored solutions may sound good from a user’s perspective, Nebula’s focus on customizability comes at a cost. If you’re not satisfied with their base hosting package, tacking on all the extra features and resources you need can add up to quite a sizable bill. Plus, the system is heavily reliant on communication with their customer support; there are certain features that aren’t automatically available to select during the checkout process, so you’ll have to contact them to ask for what you want. That said, one area in which they’ve tried to give a sense of security to their customer base is in their price freeze policy. Their first Webhotel package, which was created two decades ago, has remained at the same price for as long as they’ve been in business. This is on top of the fact that they’ve upgraded the hardware and technology throughout, so you’re getting much more value for the same price. Nebula does not have a money back guarantee or free trial available, which is understandable given that their entire business model is predicated on creating a tailored solution that will completely satisfy you. If there’s an aspect of your hosting that doesn’t work well for you, contact their customer support and they’ll work with you to find a solution. Customer support is available via telephone during Finnish business hours (9 am – 5 pm on weekdays). Alternatively, you can reach them 24/7 through the ticket system in your MyNebula customer portal. At this time, their support is only available in Finnish, so you’ll have to speak the language to be able to connect with them. Nebula’s ICT solutions are indeed comprehensive and highly customized, which is excellent for their primarily Finnish customer base. However, non-Finnish businesses and beginners might be better suited looking elsewhere for hosting. Wondering how Nebula stacks up against other Web Hosting companies? Enter any other Web Hosting company and we will give you a side-by-side comparison.